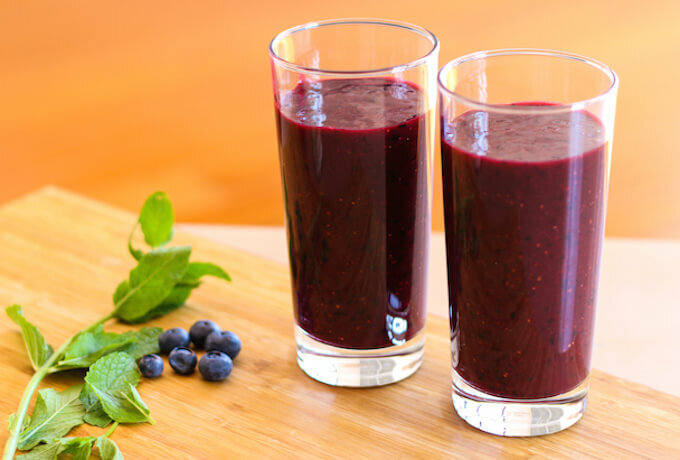 Enjoy this very berry smoothie of blueberries, strawberry, raspberry and blackberry with a hint of mint; before the fresh berries are completely off the market. You can even freeze the ingredients in a freezer bag and simply pop them in a blender to enjoy this healthy breakfast smoothie even after the berry season is over. Though a fresh berry smoothie tops the frozen berry smoothie any day, so don’t let the season get over on your breakfast table, just yet! This mixed berry smoothie is a celebration of my favourite berries. I measure and keep berries in a box in the fridge the night before and then the next morning, it is just 5 minutes to a healthy and filling breakfast. It makes an easy to-go breakfast as well. I feel so happy that we moved to Romania in summers. I had never seen so many different varieties of fresh berries all-together in the market. At our local fruits and veggie market, the girl had started to know me as the one who would be picking a cup each of all the berries every other day. I love snacking on them during the day especially when I am sitting on the computer and working on the blog. 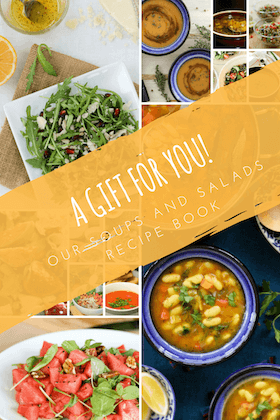 They are such a healthy way to satisfy that in-between meal hunger pangs. Berries are such a lovely addition to fruit smoothies, fruit bowls, salads and baking. I love the way the colour of the whole smoothie changes as soon as a few dark blackberries or some deep pink raspberries are added into the blender. Before leaving Bucharest for a month long travel, I made plenty of freezer bags of two servings each of this berry-delicious fruit smoothie to enjoy whenever we want! If you enjoy berries, and like this recipe, do leave a rating below and/or a comment after the post. It will really encourage me :-). Wash all the berries under running water in a colander. Trim the top of strawberries and then put all the ingredients in a blend. For a thick smoothie bowl (to eat), use 1 cup of dairy free yogurt instead of water. Berries are usually very sweet, so adjust the maple syrup according to your taste. 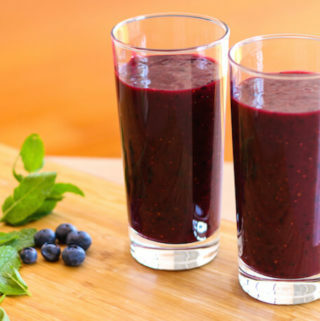 What is your favourite smoothie recipe with berries? Do you mix them with other fruits or prefer them stand alone? If you try this smoothie mix, do tag me with #weekendkitchen on instagram or connect with me on Facebook, Twitter, Google+, and/or Pinterest.